I think a lot about what makes a good person and the concept of goodness. Is goodness innate or is it something that we do or do we become good over time via actions and choices? Are we born good people or bad people? Or are we born neutral? And if so then it must be our actions that are good or bad or neither, and not us. Is goodness the same as kindness? Is goodness even something that, at the end of the day, we should be striving for? Aren’t good people more likely to be disappointed and taken advantage of? Goodness is a nebulous concept, hard to quantify and infinitely variable. If you asked 100 people on the street how they define goodness, you would get 100 different answers. Goodness is kindness. Goodness is not kindness. Goodness is treating people well, goodness is trying not to hurt people. Goodness is putting the best version of yourself into the world, goodness is accepting people even at their worst versions of themselves. Is goodness the same thing as kindness? Is it all about holding the door for people, making them soup when they’re sick, and giving second chances? Kindness and goodness both, ostensibly, put positivity into the world, and so they function similarly. But are they the same? Kindness is about treating people right, whereas goodness is about doing the right thing. Treating someone with kindness isn’t necessarily the right thing to do in every situation. Sometimes you need to be kind to yourself and not to someone else in order to do what’s in your best interests. Does doing good things make you a good person? Or are they different? Maybe Good People don’t have to worry about trying to do good things. Maybe they don’t have to question every decision they make and ask themselves if that’s the right thing to do. If you choose to do good things does that make you a good person, or if you have to choose does it mean you’re not a good person? If we’re born good or bad then it doesn’t matter what we do. But it so obviously does matter what we do. We hurt people or we don’t. We’re kind or we’re not. We make the world and our place in it better or we don’t. So we can’t be born good or bad. We must, then, be born neutral. And so it must be our actions that are good or bad, and doing good or not doing good must be what makes us good or bad. This is how I see it. We’re all just people, neither innately good nor innately bad, trying to get by on a rock hurtling through space at 67,000 miles per hour. We do good things or we do bad things or we do things that are neither good nor bad. If we act with kindness, if we treat others well, then we’re good people. If we do good things, then we’re good people. And as for whether we should be good people? The world is unfeeling, and life is cruel, so every bit of good we do matters. This is the first installment of something I’m trying out. I’d like to share some nerdy links with you guys, and I’ve been collecting them this week. Here goes. 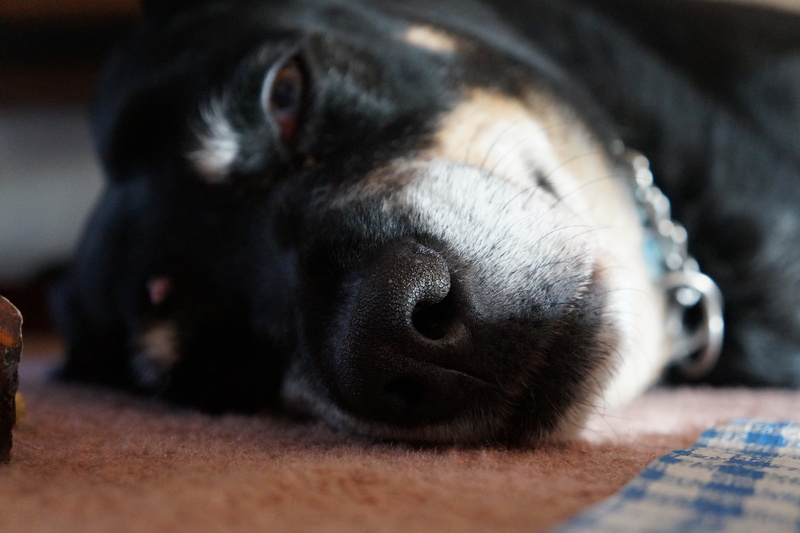 This is in no way a nerdy link, I just really like this picture of my dog. Perfect for this time of year, The Evolving Face of Santa from Smithsonian Magazine. Not only does this have a cool slideshow of past Santa images, but it gives you a basic intro to Santa in the US. Why do we wear white wedding dresses? Because Queen Victoria did. Try explaining this one to your very old-fashioned grandmother, I dare you. Did Civil War soldiers suffer from PTSD? I’d wager that most historians, or anyone who’s ever studied the Civil War in an academic setting would say yes, this is not surprising. But I’m quite glad it’s being talked about, because it may help to remove some of the stigma from modern cases of PTSD. The Pantheon has withstood an awful lot of earthquakes, invasions, and weather over the last two thousand years. How? Apparently, it’s all about volcanic ash. The oldest organized town in Scandinavia might be even older than anyone thought, from Archaeology Magazine. Also, archaeologists have identified the oldest dated bronze item in Britain: a dagger found in 1989. It was found with Racton Man, who stood more than six feet tall, and was older than 45 when he died. How To Roast Tomatoes (do you know how long this task has been put off in my Any.Do? DO YOU? No, you probably don’t. At least 45 days). The Orphan Black Season 3 trailer is here! Let’s freak out together! This morning, I shared a spoken word poem on my YouTube channel called Scorch Marks. I wrote it to be read aloud, but I think it can stand on its own two feet as a written word poem. You can watch me perform it here. Sharing a spoken word poem on my YouTube channel was one of my Revised 25 By 25 goals. Be the star of legends for generations. Leave fires burning in my wake. And make sure burns aren’t the only marks I make. Since I just finished chapter 2 of my research paper, I decided to share my paper writing tips. The paper I’m writing has to be at least 20 pages, and write now I’ve got about 25, and I haven’t written chapter 3 yet. This is also how I wrote my senior thesis, so it’s been tested a few times. This is the best tip I can give, although I’m not good at taking it myself. True story, I rewrote my entire thesis in 48 hours after procrastinating the editing/rewriting process. I didn’t sleep, mainlined lemonade, and cranked it out. It was not cute. Don’t do this. Find you best background noise. Depending on what I’m writing, I listen to different things. 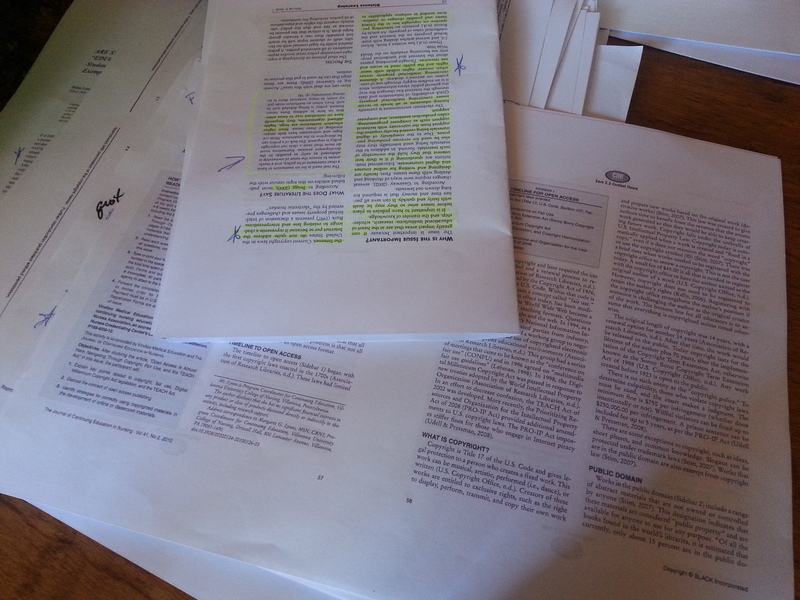 For some papers I need no music, just Coffitivity or Soundrown. For others, I need opera or dubstep with very limited vocals, preferably no vocals at all. Still other papers require a specific artist. With this paper I’ve been listening to Bastille almost exclusively, with the occasional Taylor Swift break. I can’t tell you what will work for you, but give those a try. Find your best writing spot. Only you know what your best writing spot is. 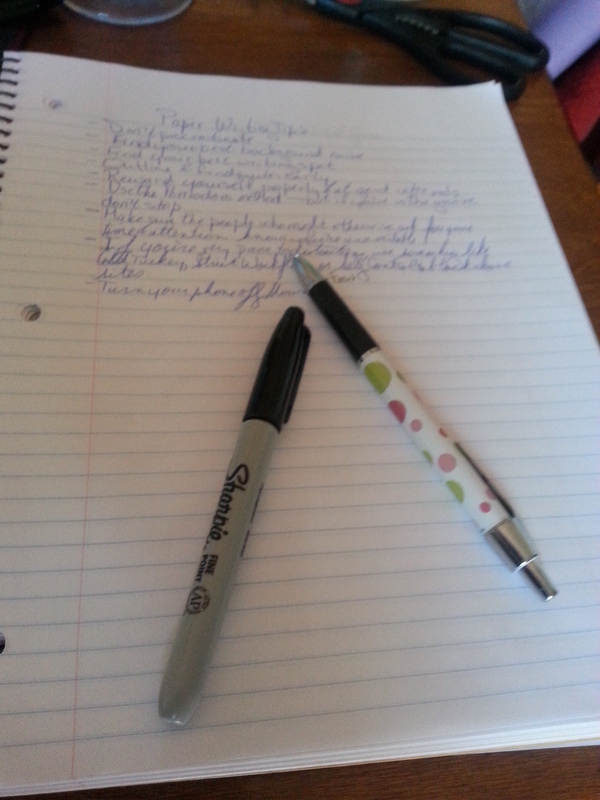 I like to write at a table or a desk, but currently I don’t have a desk, so I write at the dining room table. It’s not ideal because I can hear the living room tv, my grandmother’s in the living room and she always wants to chat, and I’m often stuck having to fix something in the house. For you, it might mean going to the library, or a coffee shop, maybe sitting in your favorite spot on the couch. Finding just the right spot is important so that you’re not distracted by bodily discomfort or by environmental factors. Outline & find quotes ahead of time. There’s nothing worse than struggling to figure out what your next paragraph is about, or trying to find a quote to support your point. Instead, I pull out quotes while I’m reading the articles, then type them into a document the page before my outline. On the outline I use lettered sections and bullet points, and include the points I want to make, examples to use, which sources I want to cite, and the quotes I’ve pulled out. I even write sentences to start the sections sometimes. Reward yourself properly & at good intervals. You have to give yourself rewards, but they can’t all be food based. That’s just not good for you. Sometimes I reward myself with a snack, but other times it’s a music video, or a TED talk (like this one by Summer Beretsky about anxiety), or a walk with my dog. For a longer break/reward, I might watch an episode of Bob’s Burgers or The Blacklist. But, I can’t reward myself for every page, not even for a 25 page paper. It’s going to be different depending on your goal, but you have to figure out the best intervals. That could be half hour intervals, five page intervals, or section-based intervals. Use the Pomodoro Method – but if you’re in the groove don’t stop. This has really revolutionized the way I write papers. Let me explain. According to this method, you work for 25 minutes, then take a five minute break. Twenty-five more minutes of work, another break. This goes on for four sessions, then you take a longer break, usually 15 minutes. You can use a kitchen timer, an app, or a chrome extension. For non-computer work (like reading and annotating) I use the app ClearFocus on my phone. For computer work I use the chrome extension StrictWorkflow which serves as a timer and a self-control aid. It blocks common distracting sites, and you can edit the list to your personal preferences. If you’re really in the groove though, don’t stop writing until you end that section. If you’re easily distracted (and even if you’re not) use an app to control your computer. I always put on an app to keep me from visiting Facebook or Tumblr or Pinterest while I’m supposed to be writing a paper. The chrome extension I use, StrictWorkflow, does this really well, so I rarely need anything else. But I used to use ColdTurkey, which blocks sites for PCs, and I know tat Macs have Self Control as well. I’m sure there are plenty of other programs and apps to do the same. Minimizing distraction is, for me, the key to getting in the zone. Make sure people know you’re working. I live with my parents and my grandmother, so I tell them “Don’t bother me, I’m writing a paper.” This always works on my mom, but not nearly as well with my other family members. When I was at my undergrad, I would tell my roommate or any friends in the lounge not to bother me unless the building was on fire. Even if you know they’ll still come and bother you, it might make them give it a second thought. Okay, so I didn’t turn my phone off while I was writing this paper. But I did put it in another room until my breaks. Our phones are such an integral part of our lives that when it rings we’re all conditioned to pick up, or check the text, or see who tweeted. Turn it off, put it on vibrate, or put it away elsewhere so you can actually get your paper done. I was living with a woman who suddenly began to stink. My mother sat in her chair all day, facing the back garden. She never spoke anymore, she never watched television, she never painted. She had always painted, even as she grew sick, the cancer taking over her body, even when she had to paint from a wheelchair. She never stopped. Until this week. She had just stopped one day. No more painting, no more soap operas, no more long conversations while I brushed her hair out. Her hair had grown though, it had grown quite a bit. Everyone says cancer patients’ hair falls out, but not my mother’s. It stayed shiny and soft, and it finally grew this last week. So did her fingernails. She never comments on my paintings anymore, though I show her every night. She’s begun to smell, even though I bathed her. The light’s gone out from her eyes, ever since my mother died. That’s a wrap! Today I’m presenting you with a piece of flash fiction I wrote for my creative writing class a few years ago. It’s one of my favorite creepy pieces, so I figured shortly before Halloween is the right time to share it. I was inspired to create a “Short Story Sunday” feature on my blog by the inimitable Kate Mitchell of Kate The Almost Great, whose writing you can find here. I hope she doesn’t mind too much. If you have a short story in you, post it on your blog and share the link below; I’d love to read it! Friends, that is not a question you should ever ask me if you don’t have all day to hear me yammer. I have so many dream jobs and so many dreams I can go on from sun up to sun down about them. To put it in short (and in internet speak): I want all the jobs. I want to do everything that interests me, and frankly, that’s a lot. I want to do history, and archaeology, and forensic anthropology, and writing and teaching and selling books and comfort food. I want to change the world. Choosing one, or even two because life is not a monolith, is nearly impossible. It’s an almost paralyzing feeling when I think about having to choose just one path to go down. I change my mind, and my goals, every day it seems. This is a terrifying time to be in my moccasins because I just don’t know what comes next. Sure, I’ve applied for plenty of jobs. Sure I’m studying to take the GRE. But what path I take after I graduate? I have no idea. What do I want? Now about that I do have some ideas. I dream of owning a bookstore in a small midwestern city and writing fantasy novels on the side; being a source of knowledge and stories and giving people the lens into other worlds that so often is exactly what you need to get through the rough days. I dream of owning a diner in a small city and serving as a hub for people’s lives. I dream of becoming a youth services librarian and helping kids and teens find great books (and having a great excuse to keep reading those teen books!) and finding new books to bring to our library. I dream of teaching high school history and introducing people to the ways in which the world was very different in a time before our own. I dream of teaching college history and opening students eyes to the ways in which the past still influences and shapes our world and our culture now. I dream of giving tours through a museum in Chicago or Indianapolis or DC with a staff ID badge clipped to my waist. I dream of working here in DC to help change the educational policies of various states. I dream of running archaeological digs in the Southwest with aspiring university students. I dream of working in a forensic anthropology lab, and helping to bring the dead home to their families. My biggest dream though, the one I play closest to the chest, the one I keep alive when all the other dreams temporarily burn out, is the camp. I dream of owning and running a history summer camp for kids, a place for them to discover what it was like to be a member of a society far removed from them. Some American history units, some ancient history units, some renaissance history units. I have starts planned, like doing the kinds of tasks a kid their own age would do at that time, learning to do some of the basic things people did, like sew their own clothes, carve their own furniture (we’d probably use clay and get a demonstration from someone old enough to handle the knives), or mold your own plates, depending on the time and place. But because I will never give up my writing dream, I would also have the kids take what they learned, and write a story about it. Write some historical fiction. Writing is a good skill for kids to have, and their grammar is improved the more they work at it. In writing historical fiction they would also have to synthesize what they’ve learned and put themselves in someone else’s shoes, which increases analytical thinking and empathy. It’s a win-win. That’s my biggest dream. That’s the one I hold onto closest and tightest. Does that mean I want it most? I don’t know. I want them all. I want to do everything and experience every field. As for my next steps, right now I’m just focusing on keeping my grades up this semester, graduating as planned, and finding a job in DC. A lot of my generation is floundering with regard to dream jobs. There are a lot of depressing stories out there about that. But then there are positive morale-boosting, motivational stories, like this one.